We were speaking of Raymond Carver's short story "The Errand" in class tonight. 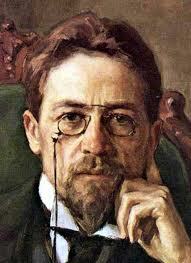 The story details the death of Anton Chekhov in Badenweiler, Germany in 1904. I mentioned that the story was in some part borrowed from the Michael Henry Heim translation of Henry Troyat's biography, Chekhov. Troyat’s rendering of Chekhov’s death is based largely on the writings of Chekhov’s wife Olga Knipper, an actress with the Moscow Art Theater. She was with her husband when he died of tuberculosis at a spa in Badenweiler, Germany. Carver lifted passages whole cloth from Troyat. Large chunks of nine paragraphs, comma for comma, word for word, in some cases. 1. In Troyat: Dr. Ewald spread his arms in a gesture of helplessness and left without a word. About this last quote. Ronald Hingley in his book A New Life of Anton Chekhov, 1976, documented the same moment, based on Olga’s memoirs, but with a different quote. “As a last resort [Olga] prepared an ice pack to press against his heart. Still conscious but now clearly approaching his end, Chekhov remarked that, ‘you don’t put ice on an empty heart.’” Heart, not stomach. Quite a difference. Had Carver not read Hingley’s version? Had he decided the quote was too sentimental? The hypotext of “Errand” is to be found in and between the lines of the text, contingent on the reader’s perspicacity. It remains implicit or fictive, since no single, identifiable text can be found, as well as multiple. The hypotext stems from many sources of information: Suvorin’s and Tolstoy’s diaries, Marie Chekhov’s and Olga Knipper’s memoirs, Chekhov’s words as reported by different people, and the various biographies Carver may have consulted, notably Henry Troyat’s Chekhov. Thus, the story proves unstable and uncertain at its core. It takes root in a hypothetical and nonexistent combination of documents that contaminate each other without leaving traces. Different genres are also mixed (diary, memoir, letter, and press release), and different voices run through the hypertext. These voices express themselves in the direct style of letters or spoken words, in the past-tense narration of memoirs, and in the present-tense narration of diaries or newspapers. There is no single, unifying voice, such as that of an extradiegetic narrator who alone controls the narrative. Rather, there is a constant intertextual contamination, the strains of which we may or may not manage to distinguish. To put the matter more poetically, there is a discreet polyphony. The free indirect style that becomes increasingly dominant in parts three and four develops this polyphony, gradually establishing a second narative voice and a second story.